Why do birds (and other animals) build nests? How do they build nests? What materials do they use? How long does it take? We really wished we could see inside our bird houses so we could see what the birds were up to! To that end, I found a clip on YouTube that showed a time lapse of a bird building a nest inside a birdhouse (some clever person had set up a video camera in the roof of the house to capture the whole process – boy, did my students think THAT was a genius idea!). 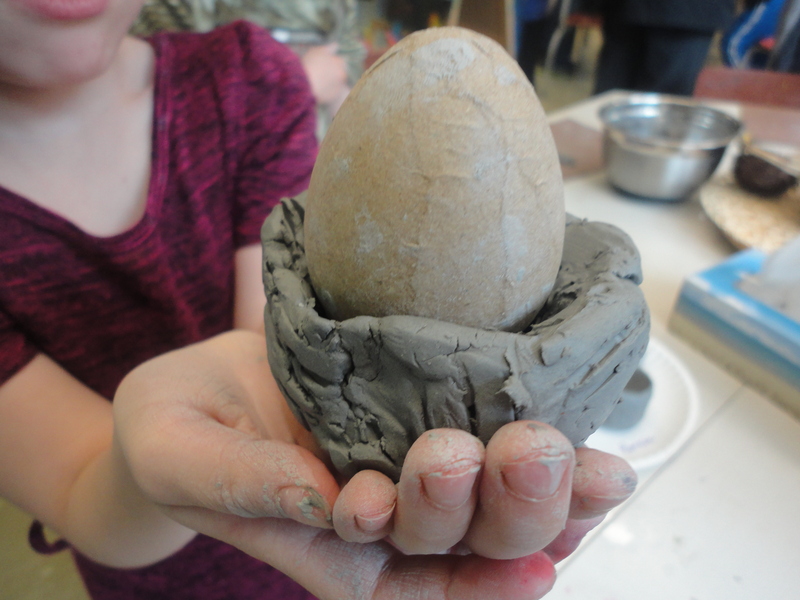 Students were asked to sculpt a nest out of clay and make sure that it could safely hold at least one egg. 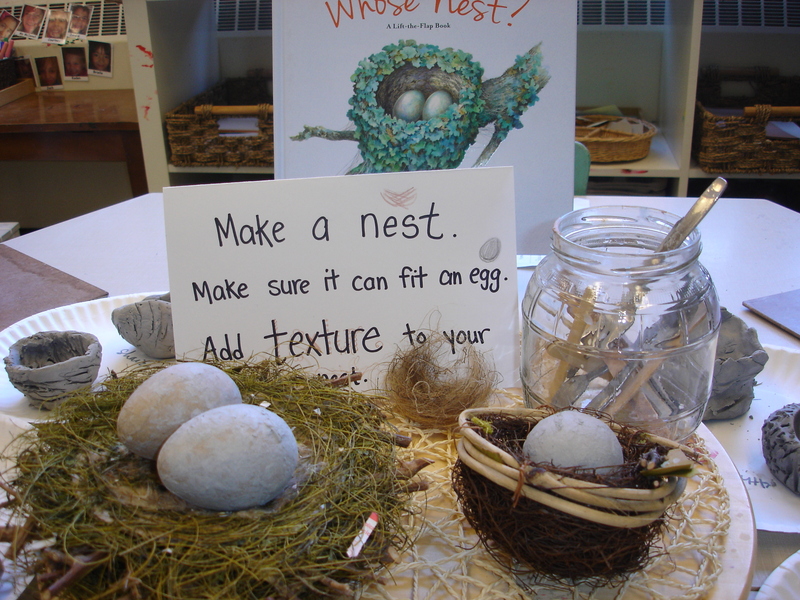 Students were also asked to add “texture” to their nests using a variety of materials. Fitting an egg proved to be a wonderful challenge that encouraged the children to problem solve as they worked – making their nests deeper, wider, or taller as necessary to safely hold the egg. When it came to adding texture, we spent some time holding real bird nests and describing how they felt – “rough,” “prickly,” “scratchy.” “soft,” “smooth,” etc. Children were given simple tools (popsicle sticks, toothpicks, forks, etc.) to add the texture they felt was appropriate. This was a new experience for my students, as our previous work with clay had required them to make their pieces as smooth as possible. 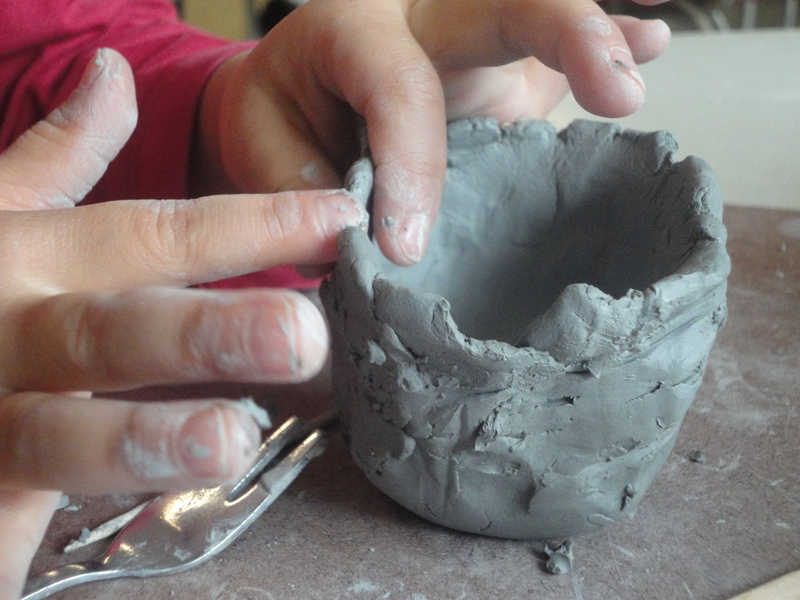 Some children had a hard time scratching up their work – in their minds, the nests needed to be smooth because “that’s what clay should feel like.” I was fascinated by this line of thinking. It just goes to show that we often misinterpret the messages that children receive from us from our teaching. S.M: The inside of my nest is very big so all the eggs can fit and won’t fly out because of the wind! Y.T: I made my nest with clay. First, I made a circle and then I put my thumb in and pushed. First the egg didn’t fit and then I pinched it more and tested it but it still didn’t fit, then I tested it again and it fit! G.M: Nests are for baby birds. The nest keeps the eggs from falling out on the ground where someone might eat them. J.M. : Nests are very scratchy. I’m going to pinch it to make it rough. I really enjoyed making this! J.K.: Nests have a bumpy texture. S.M. : My nest has a rough texture on the outside and a smooth texture on the inside. It’s smooth in the inside because we don’t want to hurt the birds. After completing our nests, the children were given the opportunity to paint an egg to put inside. 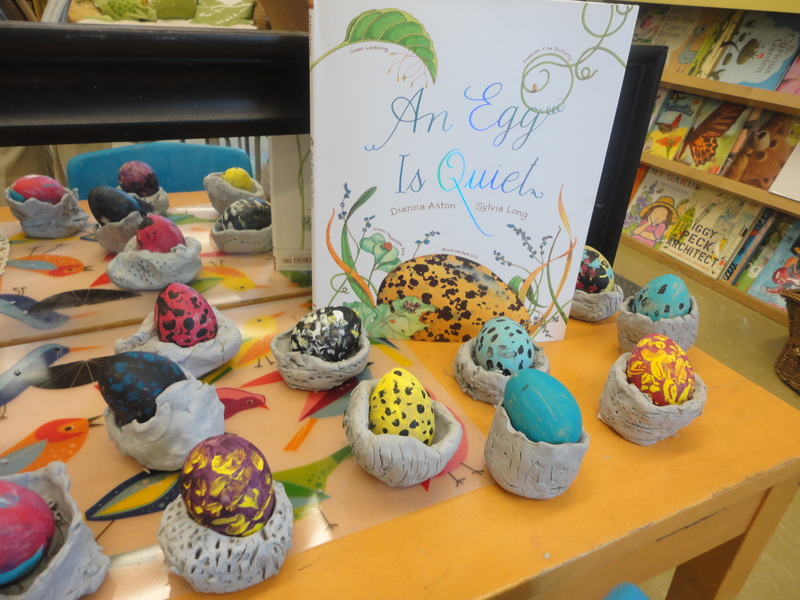 We read An Egg is Quiet by Dianna Hutts Aston and Silvia Long (one book of many in a wonderful series – definitely worth checking out!) where we learned about the different sizes, shapes, designs, and textures eggs can have. We also discovered that eggs can be laid by a wide variety of animals! 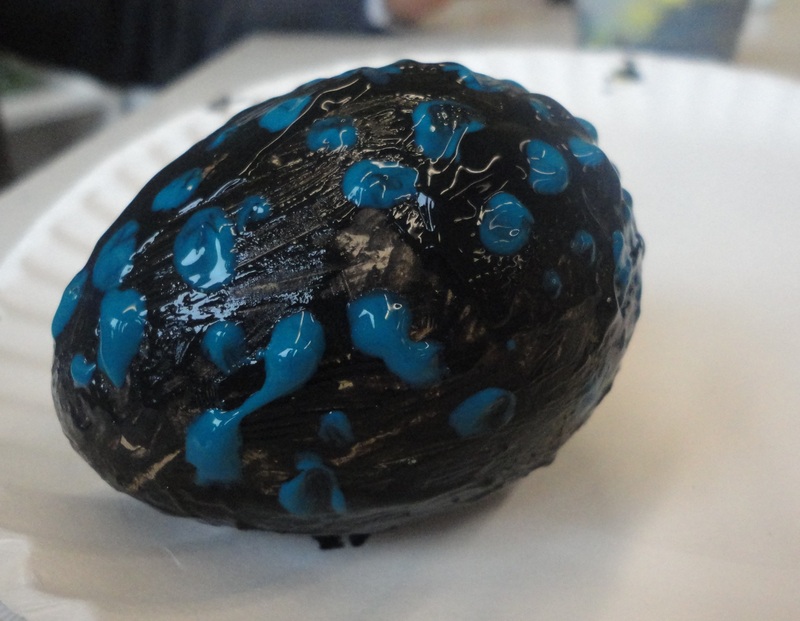 While working on their eggs, the children were asked to imagine what creature might hatch from their egg – a wonderful, creative exercise that greatly influenced how the children designed and painted their eggs. M: That’s a crab egg. It’s red with black spots! M.B. I knew he was making a crab egg. I knew it because he made it so red! 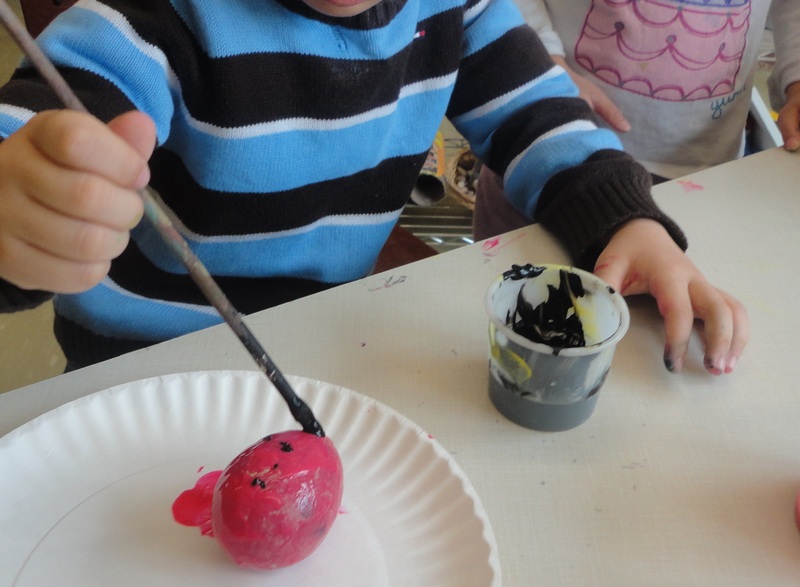 M.C: I’m painting my egg black because there’s a black snake inside! R.K.: Mine is a blue jay egg. It’s just blue because a blue jay is blue. Oh, I love my egg! J.M. : I made my egg green with white, yellow, and blue. I put on black speckles and blue lines. There’s a little robin inside. Our display of nests and eggs is in the centre of our classroom, at the children’s level. Our students can be found admiring their work daily (and they can’t wait to take them home!). Are you working on a bird or nest inquiry at the moment? What kind of thinking is happening in your class? I’d love to hear what you are up to! 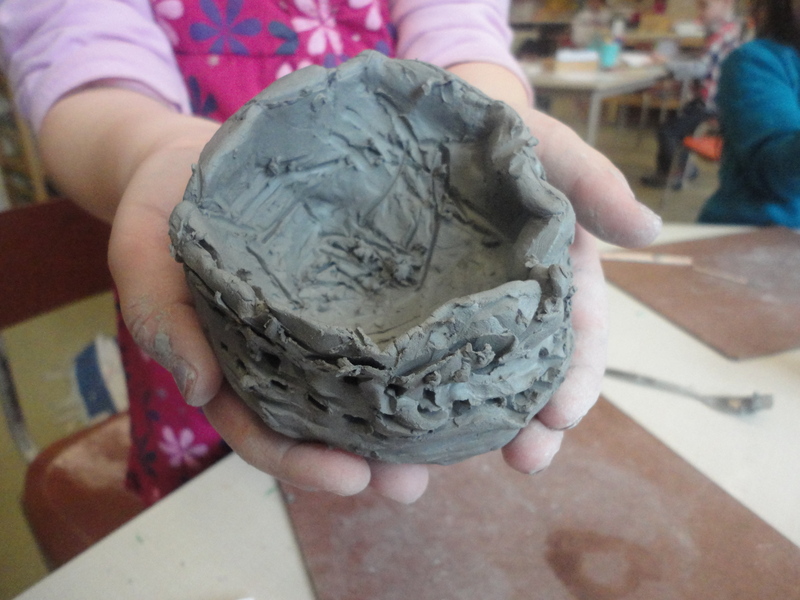 This entry was posted in Art Studio, Outdoor Classroom, Provocations, Science and Technology and tagged an egg is quiet, art studio projects, bird inquiry, clay nests, eggs, nests, oviparous animals, Reggio inspired kindergarten, texture in art, working with clay by msmcdonell. Bookmark the permalink. Your blog is so inspiring! Keep posting! Your classroom is absolutely beautiful! I can tell your students are very engaged! It is awesome! Hi! Just discovered your blog – it’s truly wonderful! I teach K as well in Toronto! It was our first year with FDK and it was quite a journey for me. I have a blog as well, Mrs. Albanese’s Kindergarten Class. I would love to be in touch and learn more from you. If you have time, please e-mail me at kindergartenteacher@rogers.com. I am always wanting to learn and grow from other teachers. Thanks! Awesome lesson! What was the “egg”? Was it an actual egg? A plastic egg? A craft egg? Would love to know! Thanks! Hi Miss Silver! It was a craft egg (made out of recycled paper). I absolutely LOVE this idea!!! I hate to sound stupid but how did you make the egg? And we painted them with tempera paint. Forgot to mention that! I have only discovered your blog recently. It is truly inspiring. Thank you so much! I recently implemented the clay nest activity. We blew out eggs and marble painted them to add to the nests. A delightful series of lessons and all the girls thatI teach, were engaged. I am very interested in Philosophy for Children and your approach works well in conjunction with this approach. I was wondering if you used fired the nests in a kiln after the children made them? Hi! No. 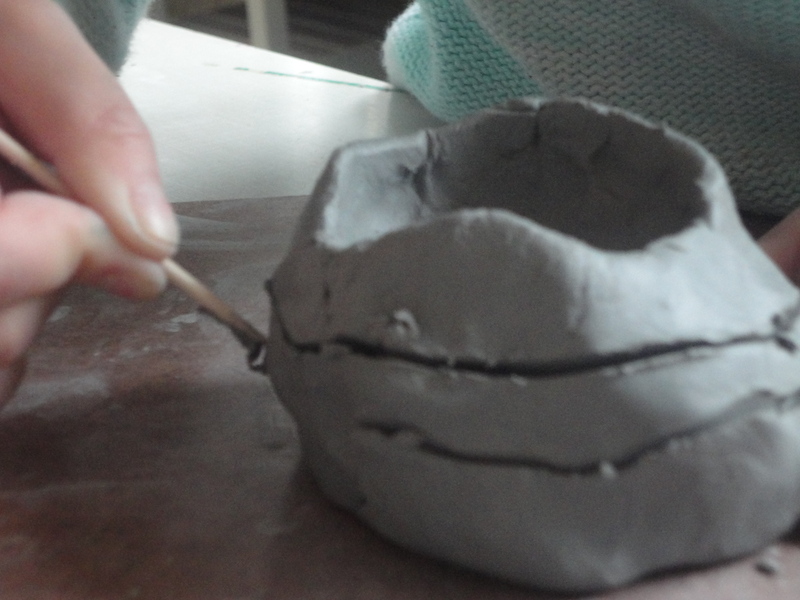 We used air drying clay. They took about 24 hours to naturally harden. I got it from an art supply store. When I did it this year we used an air drying clay made by Crayola.